Explore ancient history and intriguing traditions, from the colonial history of Yangon to the last royal capital of Mandalay, the vast awe inspiring expanse of stupas in Bagan to the captivating fishing traditions of Inle Lake. See the friendly and lovely people and their lifestyle. Welcome to Myanmar, upon arrival at Yangon Airport you'll be met and transferred to your hotel. The rest of the day is at leisure. Overnight in Yangon. Today enjoy a fascinating guided tour of Yangon. First stop is Yangon City Hall before you continue to Sule Pagoda, located in the heart of the city. Nearby, you will visit the peaceful Maha Bandoola Park, which is encircled by a number of colonial and heritage buildings from Yangon's past. Conclude the morning at Botahtaung Pagoda, built around the same time as the Shwedagon Pagoda. Lunch will be enjoyed at the Rangoon Tea House, which has been carefully restored and is reminiscent of the grand tea houses that were common in the British colonial era. Then you'll explore the Bogoyke (Scott) Market, a maze of colour, home to various stores selling wares ranging from art to gemstones. The final stop this afternoon is the Chaukhtatgyi Pagoda which houses a 70 metre long reclining Buddha. This Buddha is topped by a diamond encrusted crown. This evening visit the awe-inspiring Shwedagon Pagoda. The most important Buddhist temple in Myanmar. It's main Stupa, vibrantly covered in gold leaf and measuring 90 metres in height, dominates the Yangon skyline. Overnight in Yangon. This morning transfer to the airport for a flight to Mandalay. Upon arrival in to Mandalay you'll be met by your local guide and will begin your sightseeing at the Zegyo Market, located in the heart of the city. Next you visit the Artisan Quarter, here you'll see examples of the fine craftsmanship dating back to the last kingdom of Myanmar. This afternoon visit the highlights of Mandalay. First up is the sacred Mahamuni Pagoda, which holds one of the most significant Buddha statues found in Myanmar, and is encased in several tons of gold leaf. Close to Mahamuni are the Golden Palace Monastery, the only surviving Royal Palace building in Mandalay, here you'll see the original style and architecture of the Myanmar Royals. Finish the day with a panoramic view over the city from Mandalay Hill at sunset, the highest point in the city. Overnight in Mandalay. After breakfast, today head out of Madalay to Inwa, the ancient capital of Shan and Burmese kingdoms for more than four centuries. You take a small ferry across the Myint Nge River, then by horse visit the Bagaya Teak Monastery, the Nanmyin Watch Tower and the Maha Aungmye Bonzan Monastery, which is over 300 years old. Later continue to the Ancient Kingdom of Sagaing, from the hills you will have a stunning view of the numerous pagodas that are dotted along the riverside. You then pay a visit to a monastery to learn more about the life of Buddhist devotees. The next stop in another ancient capital, Amarapura. Famous for its textile production, you'll learn traditional fabrics woven at a local workshop. The final stop today is Ubein Bridge, a simple yet remarkable teak structure that spans 1.2km above the Taungtam Lake. Overnight in Mandalay. 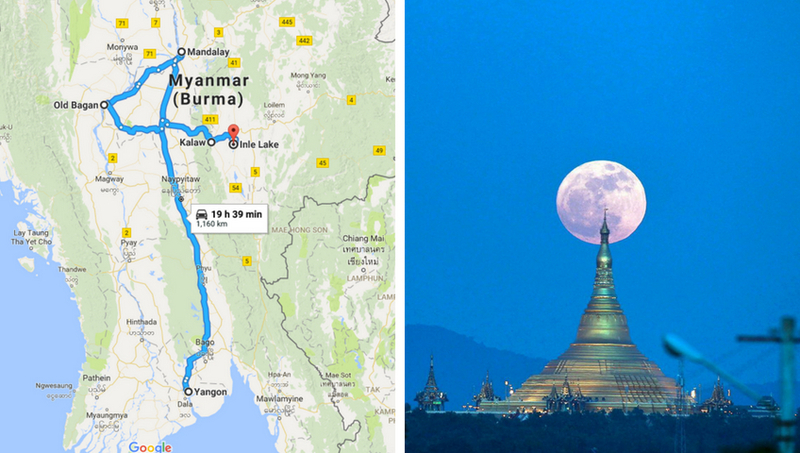 This morning fly to Bagan, where you'll be met by your local guide. After making your way into the city you will first visit the busy local market before visiting the Dhamayazeka Zedi, which offers panoramic views of the temple scattered plains below. From here visit the Archeological museum and the gold gilded Swezigon Stupa, which is said to hold a holy tooth relic of Buddha. Close to this Stupa is Myingaba Gu Byaukgyi Temple, with some of Bagan's best preserved mural paintings depicting the Buddha's Jataka re-incarnation. Later visit Myingaba Village, where you'll learn how Bagan's famous lacquerware products are produced before ending the day at the beautifully symmetrical and majestic Anada Temple. This temple is home to four standing Buddha statues that gaze at the viewer with fixed serenity wherever you stand. Overnight in Bagan. This morning there's the option to view the incredible ancient kingdom of Bagan from above on a sunrise hot air balloon ride.Start your sightseeing today with a visit to the Manuha Temple, built in the 14th Century before we continue to the Thanaka Museum and a cigar workshop. Later visit the Nyaung U market, the largest market in the Bagan region. From here you'll get to see some of the cottage industries, such as brick making, that are carried out using traditional methods. Final stop of the day is to a monastic school, offering free primary level education to local children. Overnight in Bagan. Today is spent exploring the countryside close to Bagan. Starting at the bottom, the 777 steps take you to the top of Mount Popa and reward you with breathtaking views of the surrounding plateau below.This afternoon continue on towards Kalaw, passing through the lush surroundings of the Shan Plateau. Overnight in Kalaw. Today enjoy a leisurely trek through the verdant greenery of Shan state. The first part of the journey takes you from Danu Village to Pawke. As you traverse this route you'll be rewarded with incredible scenery, passing through rice terraces, ginger farms and chili plantations. Stopping for lunch in Pawke village you then continue your trek through Crab Apple tree to Pattupak where you spend the night. Overnight in Pattupak at a local home or monastery. This morning enjoy breakfast at a local monastery (or local home). After your ascent yesterday, today will be much more downhill as you walk onwards through the villages of Kyauksu and Nanyoke Village until you reach Inle Lake. After 5 hours hiking you'll make a stop at Tonele, on the western shores of Inle Lake, transfer to the jetty for your boat across Inle Lake. The boat trip takes you to the western end of the lake and to Indaing. You can have lunch here at the Bamboo Forest Restaurant. After lunch we head by boat to the town of Nyaung Shwe, where your hotel is located. The one and half hour journey takes you across this impressive expanse of water. At 1000 metres above sea level, the lake is a living body in more ways than one, with stilt houses dotted close to the shore.This afternoon a boat trip takes you to the western end of the lake and to Indaing. En route you'll pass through the busy village of Ywama. After a journey through a tree lined canal we'll disembark and visit the numerous pagoda ruins of Nyaung Ohak, dating from the 14th to 18th century. The pagodas have been left un-renovated giving the area an captivating atmosphere. Later travel back across the lake to your hotel for the night. Overnight in Inle Lake. This morning explore one of the 5 rotating markets in the area (only open certain days). Here you'll gain a valuable insight into the lifestyle of the Pa-O, Danu and Intha people. You'll get to witness the famous leg rowers attempting their catch, whilst learning about these traditional methods of fishing.This afternoon head to Phaung Daw Oo Pagoda, the holiest site in the Southern Shan State. Later continue by boat to visit Nga Phe Kyaung Monastery, housing Buddha statues at nearly 200 years old this is one of the oldest monasteries on Inle Lake. Return to your hotel as the sun sets across the lake. Overnight in Inle Lake. Travel to Nyauang Shwe Town today and pay a visit to the Red Mountain Estate Vineyard. Whilst Myanmar is not traditionally known as a wine growing country, however, this estate started in 2002 and produced it's first wine in 2008. You'll have a chance to taste some of the wines they've produced and to explore the grounds.Later continue to Heho Airport for your flight back to Yangon. Upon arrival in Yangon you'll be met and transferred to your hotel. The rest of the day is at leisure. 2 day and 1 night trek from Kalaw to Inle Lake including lunch and dinner on Day 8.